Which CO2 Sensor is Right For You? For indoor air quality projects, indoor greenhouses, student projects, or connecting to Arduino or Raspberry Pi, the fastest and easiest way to accurately measure carbon dioxide is the COZIR Ambient Air CO2 Sensor Development Kit. The kit includes a GSS COZIR sensor, an FTDI USB cable with connector, and our free GasLab® software. Since it is powered from the USB bus, it doesn't require any soldering or an additional power supply. 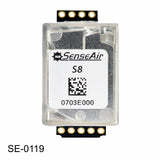 For scientific accuracy on a budget, we recommend SenseAir's K30 10,000ppm CO2 sensor. Used by scientists and engineers worldwide, The K30 is the most stable, accurate and low-cost NDIR carbon dioxide sensor on the market. In fact, scientists running 2 properly calibrated K30 sensors in parallel have been able to match accuracy requirements of CO2 meters costing tens of thousands of dollars. Use the USB development kit and free software to get running in minutes, or get out your soldering iron and programming skills to integrate it into any project. OEM Manufacturers should consider the S8 Miniature 10,000ppm CO2 sensor. This next-generation NDIR sensor is reliable, has a small footprint, and is easy to integrate into high-volume OEM products. For applications where low-power is critical look at the LP8 Miniature 10,000ppm CO2 Sensor or the COZIR LP Miniature 5,000ppm CO2 Sensor. Both are designed for battery or solar powered applications. If real-time sensing speed is important, check out the new SprintIR6S 5% CO2 Sensor, capable of measuring CO2 levels up to 20 times per second. Which % CO2 Do You Need? Indoor and outdoor air has between 400ppm and 2,000ppm CO2 by volume. This means that for projects from measuring indoor air quality to measuring atmospheric CO2, a 0-1% (0-10,000ppm) CO2 sensor is your best solution. For applications like CO2 alarms in restaurants, breweries, or around stored CO2 tanks, a 5% CO2 sensor is used. OSHA requires alarms be present at 1.5% and 3% CO2. Other applications like modified atmosphere packaging, bio-reactors, cryogenics, or SCUBA require sensors between 5 and 100% CO2. In general, you should know the highest level of CO2 you need to measure, then select the a sensor that can read that level. This is because the wider the range of CO2 measured, the less precise the readings. Learn more about CO2 sensor ranges here.